ZURICH, SWITZERLAND--(Marketwired - Mar 24, 2014) - Noted as a Thailand holiday in the heart of Zurich, the White Elephant restaurant inside the Zurich Marriott Hotel is undertaking a year-long culinary adventure destined to take its guests on a more intimate journey through Thailand with a seasonal offering of authentic cuisine from specific regions of the country. Adding to the intensity of this year-long adventure, the restaurant ignited a blogging frenzy with its recent Thai tasting/blogging event held February 25 featuring the diversity of culinary delights that will add excitement to this prominent restaurant's classic Thai flavors throughout the year. Providing residents and visitors an exceptional Zurich dining experience with its authentic Thai cuisine for more than 20 years, the White Elephant welcomed 43 guests, including eight bloggers to the event to unveil its journey which started in southern Thailand for the first quarter and will be followed by a taste of northern Thailand from April to June. Tasty favorites found in central Thailand will complement the restaurant's menu from July to September, with the series concluding with treasured delights from the Isaan during the final three months of the year. Just to name a few of the expected features, those attending the event previewed Nam Prik Ong Pork dip with chili paste, Gang Hang Lae Traditional curry northern-style, Gang OOM Gai/Grilled chicken curry Isaan-style, Spicy Duck Salad, Supply Pad Sator Stir fried prawns with stink beans and minced chicken, and Massaman curry with chicken Massaman Gai as part of the February tasting event. While the special menu of White Elephant changes as this journey progresses inside the towering hotel in Zurich, the restaurant's friendly service and exceptional culinary designs remain unmatched as native Thai chefs prepare dishes with fresh herbs and a variety of spices. And, regardless of the region from which the food represents, guests may order based on the level of spiciness preferred. Allowing Zurich residents and visitors the opportunity to experience exotic dishes from Thailand, the White Elephant's team of skilled culinary professionals works diligently under the direction of Chef Sakol Sasomsri to bring authentic tastes to those who chose the relaxed and tasteful atmosphere of this pristine accommodation neatly set along the Limmat River in Zurich. The Zurich Marriott Hotel welcomes guests to its convenient city center location just steps away from the train station and neatly positioned along the pristine banks of the River Limmat where they can relax amidst the comforts of high-tech amenities and Marriott's renowned service. Complimentary Internet access in public areas allows guests to easily stay connected and productive while embracing the comfortable and eco-friendly atmosphere of an ISO 14001 hotel. Well-appointed guest rooms and spacious suites include luxury linens, 24-hour room service, Plug-in technology and International cable/satellite service to ensure guests have everything needed for a truly remarkable Zurich hotel experience. Noted as a Thailand holiday in the heart of Zurich, the White Elephant restaurant inside the Zurich Marriott Hotel is undertaking a year-long culinary adventure destined to take its guests on a journey through Thailand with a seasonal offering of authentic cuisine from specific regions of the country. 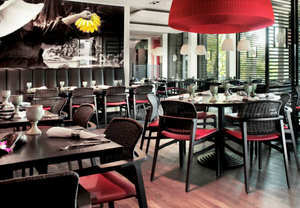 The restaurant provides an exceptional Zurich dining experience with its authentic Thai cuisine.